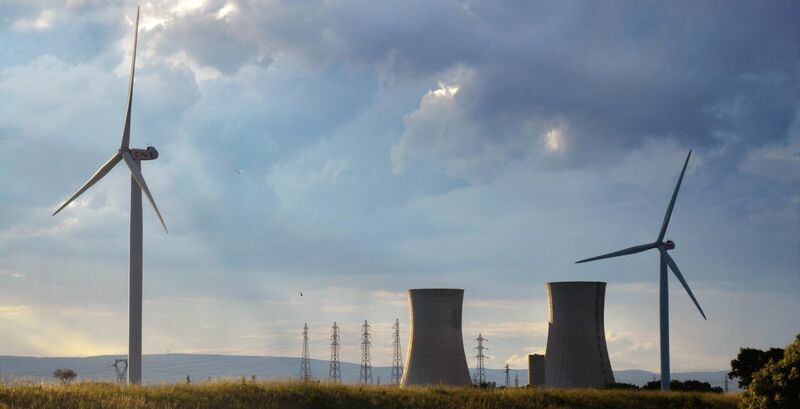 Can nuclear and renewables coexist? Ramping – when power plants adjust their output according to market needs – is crucial in an energy system that includes renewables. So can nuclear reactors ramp enough to accommodate significant shares of wind and solar? Craig Morris takes a look. At the end of January, I published a discussion paper for the IASS (Institute for Advanced Sustainability Studies) investigating whether the existing reactors are technically able to adjust to wind and solar. A lot has happened since then. One of the main criticisms that climate hawks outside Germany have of the Energiewende is that Germany is closing nuclear before coal. They assume that nuclear reactors can ramp considerably more than they have historically; the plants simply didn’t need to do so. Nuclear has the lowest marginal costs: the fuel is cheap, but the plants are expensive – so once you have built them, you run them as much as possible. The economic argument is correct. But what about the assumption that existing reactors have a technical ability they have never demonstrated? Last summer, I summed up my preliminary findings in this blog. The technical capability of reactors to ramp is clearly shown by individual units, but never as a fleet. The reactors seem to take turns ramping, as though the number of times they change output should be minimized. In my discussion paper (PDF), I tried to find out whether, for instance, wear and tear is the reason. The answer is disappointing: we don’t know. As one researcher wrote in 2010, “no systematic study has been made on this topic.” I could not find such a study since 2010 either. We do know that damage from ramping has only been reported for one reactor worldwide: Germany’s Brokdorf. Below is the quite limited ramping at that reactor in 2016 leading up to the damage. 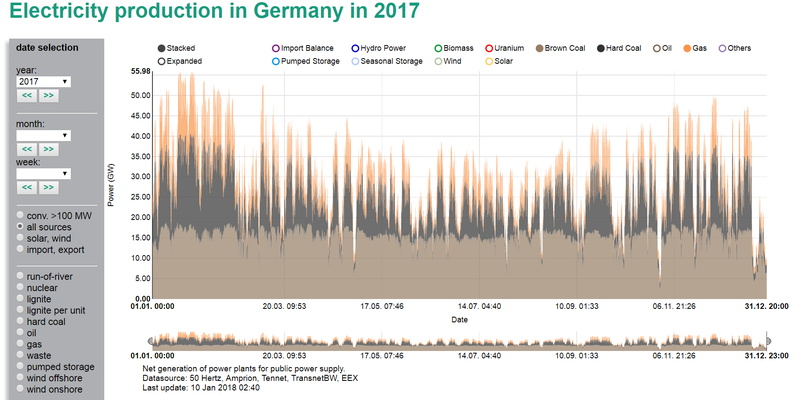 For a comparison, here is the ramping that the entire German power plant fleet – nuclear, coal, and gas turbines – had to perform in 2017. Fossil-fired power plants did most of the ramping, as we see once we take nuclear out – the ramping looks even greater below. Note that this ramping is required for a mere approximately 20% wind and solar. The lack of past ramping does not, of course, demonstrate that reactors are technically incapable of more ramping, especially since there is a plausible economic reason for the lack of historic nuclear ramping. So what is the technical capability? Here, statements are contradictory, even among proponents of nuclear. 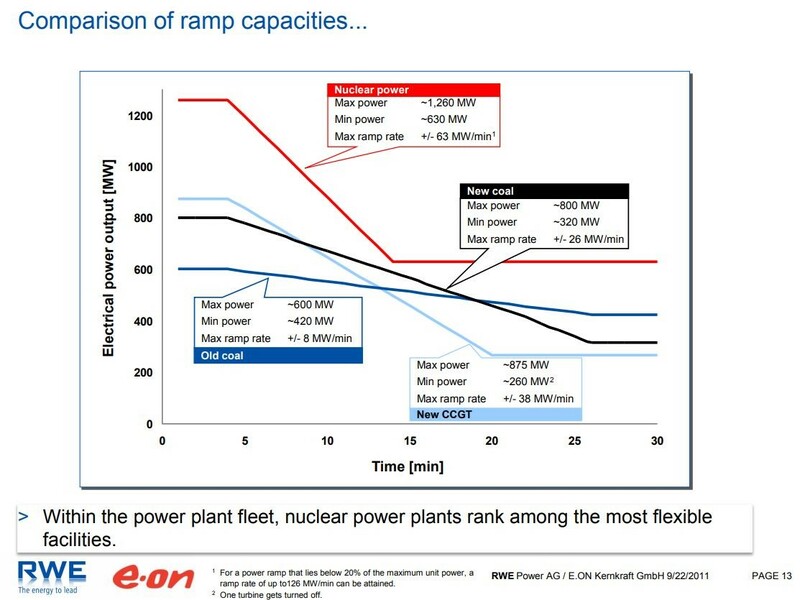 For instance, a presentation given jointly by German utilities RWE and Eon in 2011 shows nuclear ramping faster than coal plants and combined-cycle gas turbines (the truly fast ones, open-cycle gas turbines, are left out in the chart below). Other studies show nuclear ramping less than coal and gas. 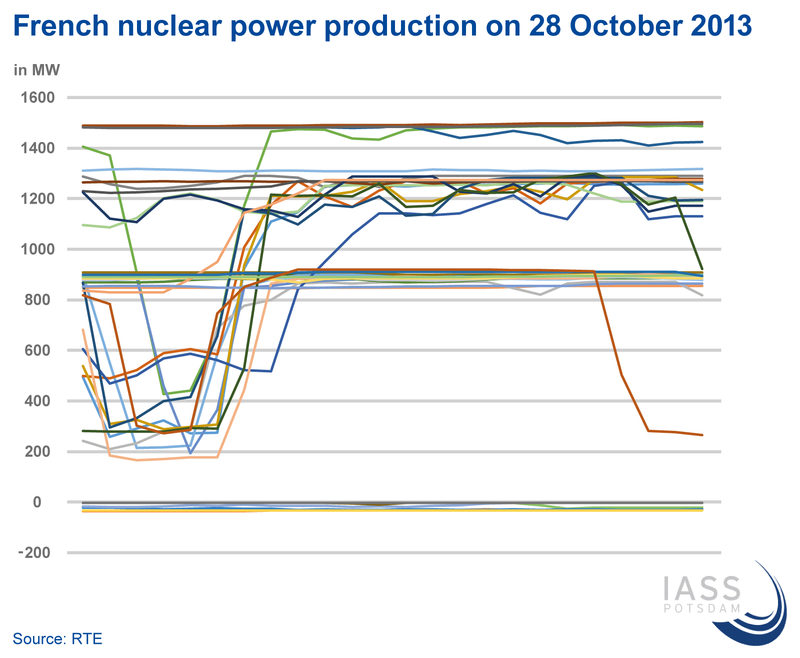 Individual French reactors take turns to drop down to 25%. Are French reactors more flexible? Possibly, but their flexibility also seems quite limited. Stephane Feutry, head advisor for nuclear production at Electricité de France, told Nucleonics Week in 2016 (vol. 57, no. 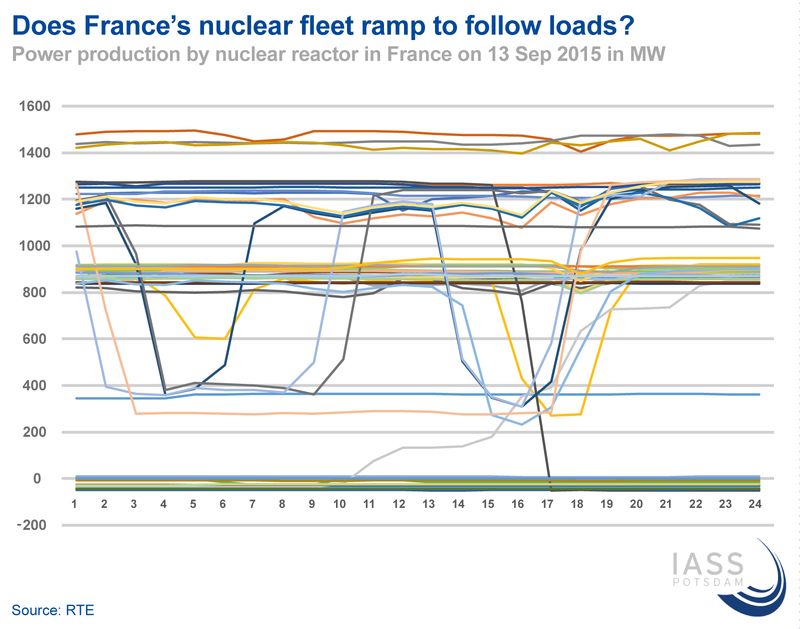 24, subscription only) that the French fleet had already reached its maximum flexibility, and no more than around two thirds of the country’s 58 reactors can operate in load-following mode (meaning ramping) at a given time. The problem is that reactors should not ramp for the first and last sixth of their fuel cycle, so each reactor is inflexible a third of the time. In January, Feutry’s colleague Dominique Miniere told Bloomberg that the French fleet could change output by 21 GW in less than 30 minutes. Maximum output hovers in the upper 50s (installed capacity is 63 GW), so that reduction is equivalent to a third. 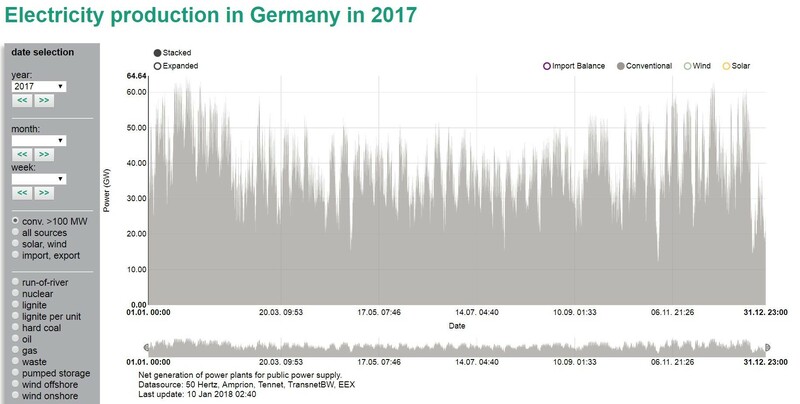 French nuclear critic Thibault Laconde took a look at the data (in French) and found that the maximum demonstrated ramping within an hour since 2011 was 5.35 GW – a quarter as much electricity in twice as much time. Feutry later told Laconde that there had been a misunderstanding: France’s nuclear fleet can react in 30 minutes or by 21 GW, but not both. Another thing is strange: if the French fleet needs to reduce output by, say, five GW (around 10%), the smallest possible number of reactors are clipped as much as possible down to around 25% of output until that reduction is reached. The rest of the fleet continues to run so unchanged that their rated output can be seen from their current output. This behavior is strange because a fleet of fossil-fired plants would more evenly reduce output across the entire fleet. My discussion paper – indeed, the entire discussion – thus raises more questions than it answers. An absence of historic evidence does not prove inability; on the other hand, it is reasonable to be doubtful until proof has been given. What we do know that a reduction of even a third of the French fleet’s entire output twice a day is not what is needed. French reactors can only go back up quickly if they just stay down for a few hours. For solar, that works well; for wind, it doesn’t – wind can blow strongly for days. We also know that a reduction in nuclear by a mere third will block the integration of wind and solar power. 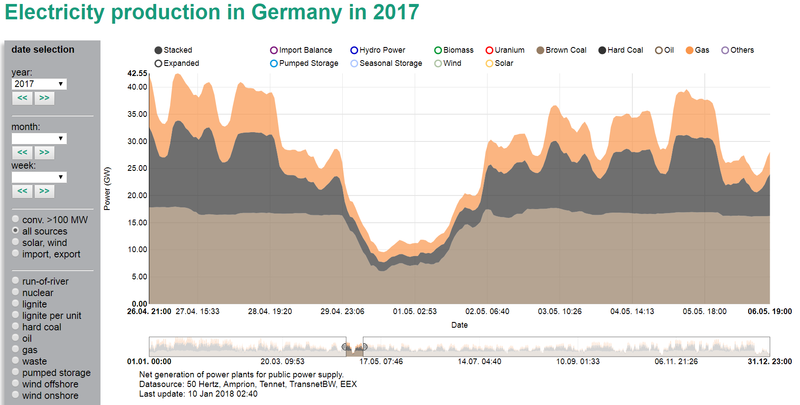 To accommodate 20% wind and solar, fossil plants in Germany already ramp by much more. Below, US researcher Jesse Jenkins visualizes a future power supply with roughly half wind and solar and a third nuclear – but the nuclear fleet ramps by 50%, sometimes twice a day. Jenkins assumption pushes the envelope of what EDF says is technically possible… and is far more than what has been attempted up to now. In the end, how you come down on this issue is a matter of faith: do you believe that an entire reactor fleet can ramp at each reactor’s technical limit regularly two thirds of the time (outside of times close to refueling) when, after four decades, no fleet has ever done so, including at times of negative power prices? We need a lot more research and open discussion about the particular behavior of nuclear reactors ramping – and possible wear and tear on the facilities. My discussion paper is an invitation: let’s discuss. Based on what I found, I contend that existing nuclear is incompatible with significant shares of wind and solar. You either stick with nuclear, or you build wind and solar – and then nuclear has to go. A mix will not work; you have to choose. Hi Craig, thanks for writing, lots to consider. Does your research consider whether a significant roll-out of storage technologies (whatever they might be) would allow nuclear and non-dispatchable renewables to live more happily along side each other? Build more pumped storage. Unlike chemical batteries, pumped storage is a sustainable & economic way to time shift wind & solar. Pumped storage also has the MWh capacity to bridge the weekday/weekend demand Delta. (Wind & solar are steady over weekends, but demand drops). EdF often turns off a few nukes on weekends. Pumped storage works equally well in leveling out nuke generation. I do disagree with your tentative conclusion. As a Climate Strategy, Energiewende has been a failure. It is also worth noting that the next generation nuclear reactors (EPR & AP1000) have been specifically designed to ramp on a daily cycle. However, most of these type reactors will be built in China. I’m not a nuclear physicist by any means, but is my understanding that shutting down a nuclear reactor causes the creation of chemical elements in the reactor core that poison the reactor and need to be eliminated (I believe by radioactive decay) before the reactor can be restarted. This means that the reactor cannot be restarted for a period of time after being shut down. I’m not sure if this happens when a reactor is ramped down, but it would certainly help explain the reluctance to ramp. It may be interesting to investigate how long it takes reactors to ramp up after ramping down to see if there is any evidence of poisoning. You really should read this. Many answers to your questions and corrections to what you write. I have learn a lot of things regarding nuke flexibility in this blog post. Your analysis lacks negative power prices. At that point, the marginal cost of running is high and is a good indicator of ramping capability. Unfortunately, Fraunhofer has never produced their price vs. percentage full load scatter plots since 2013/2014. EdF has a lot capacity besides atom power. So soon enough EdF has no choice no more if ramping hydro power or other assets. If atom power fits technically into a mafia business is non-relevant. Atom power is always a mafia business and this doesn’t fit into a democracy, into a humane society. You can reach the same conclusion simply from the economics. Nuclear reactors have very high fixed capital costs. Running them half the time to accommodate wind and solar will either double the cost of nuclear electricity, or leave reactor owners facing massive losses. If you give nuclear despatch priority in a high-renewables world, it’s the owners of the renewables that get hit by the losses from curtailment. It’s either WWS or nuclear. This helps explain the virulence of the opposition tor renewables from the pro-nuclear camp, see the Clack vs Jacobson controversy. Thanks for the notes on the mixed results for ramping of current reactors. I tend to believe the French 1/3, 2/3 etc. – it is really somewhat complicated. What is evident for future hypothetical flexible ramping reactors is that low capacity factors for a nuclear plant (as expected for high renewable fractions) send the costs through the roof. It would be interesting to see how this compares with the currently pretty crummy economics of P2P via H2 (for which I do have future hopes). Commercial p-2-g (hydrogen) is done in Germany by Windgas, a company founded by Greenpeace. They make a profit and their business commercial since REs are pushing power prices into the low and negative: the hydrolysers get paid to take power from the grid. By this way Windgas can offer gas (methane mixed with hydrogen) to the household consumers at about the lowest price compared to competitors who do not use p-2-g or only very little (from experimental hydrolysers). As a former Navy nuke, I can testify that nuclear fission can be even more responsive than the best combustion technologies available in a given size range. It is a characteristic of all systems that increases in size lead to increases in inertia and an subsequent reduction in the responsiveness when measured as a portion of the capacity. If measured in MW/min, however, a fleet of nuclear plants can, if necessary, respond as rapidly as a similarly sized fleet of large fossil fuel plants. There are wear and tear issues associated with rapid load changes due to the changes in temperatures and pressures. That’s true no matter what technology we are talking about. My informed opinion is that the reluctance to involve high capital cost nuclear plants in repetitive cycling near the maximum design rates is due to the fact that maintenance and repair on those systems can be far more expensive than maintenance and repair on cheaper machinery whose total operating costs are dominated by fuel costs. People who ride expensive Harley Davison bikes tend to operate them more sedately than people who ride little dirt bikes and its not just because the former appeals more to an older customer. If nuclear plant designers can successfully create and deploy far less expensive and smaller machines – and I’m confident there is are several paths not yet taken that can achieve that situation – some of the flexibility issues will be resolved. Finally, I agree with your overall premise. If one accepts a societal goal of maximizing the contribution of wind and solar, with a continuous building program even if there is already sufficient electricity capacity that already is emission free, then nuclear plants are a barrier to achieving the goal. I don’t buy that goal as a valid one, but at least you are more honest about your motives than most people in the discussion. There is room in a grid with a strong nuclear component for fluctuating renewables. Without knowing a lot of details about the system, or doing any studies, I’d say the comfortable limit is a relatively low penetration percent of perhaps 20% or less. At the higher end of that range, the renewables will begin asking nuclear plants to curtail their output in order to allow them room on the grid to sell their power. If the nuclear sector was a competitive free market enterprise, I see no reason why they would roll over and allow that kind of market share reduction without substantial resistance. The only hope for real flexible nuclear are SMRs. Let’s wait and see when can they ever commercialized. SMRs are commercialized since decades but are dangerous and far to expensive. The SMRs pulled ashore in Siberia are cut up by specialists from Germany and put into large barrels.The costs for this operation can’t be afforded by manufacturers, owners, users … these costs are a third world aid paid with electricity taxes of German consumers. Electricity in Germany is taxed high enough to make up for safe bottling of deadly SMRs build by ignorant atom clowns. Statnett in Norway provides realtime electricity generation figures for Nordic countries. Last evening around 8 pm, there was 0 MW wind generation in Finland, out of capacity of 1200 MW, stretching from the Gulf of Finland to Lappland. I actually took a screenshot of those numbers. The temperatures in Finland were between -10 and -20 C at that time. We use electricity for heating our homes a lot. Luckily, we have nuclear power, hydropower and biopower (CHP). Some fossil fuel thermal too but we’ll get rid of it once Olkiluoto 3 is running. It makes sense to have your eggs in several baskets instead of one. Wind and solar need 100% backup in some form. Plus, it’s cost-effective. Our industrial electricity prices are 6-7 c /kWh, less than half what they are in Germany. Same with residential prices. Atom clowns don’t spare with lies, Jarmo. Sorry, Entsoe doesn’t allow for direct links. A new page opens and there you can choose country and date. Nuclear operators have no idea how their power plant behave exactly because of thirty years of constant repairing and upgrading so their vision is that everything should be kept the way it was yesterday for security reasons. However you can make a nuclear power plant flexible with the very same way you make a concentrated solar plant flexible : by storing heat for later use. Another option is diverting steam for heat recovery : when there is a lot of sun or wind it will be more profitable to sell heat to reduce natural gas use rather than selling electricity that nobody needs. When the Germans built their nuclear plants, they also built several MW of pumped hydro storage, to gain more flexibility. This should answer the question. Really, nuclear is way too inflexible for renewables, and therefore California is bailing out (mainly due to solar increasing). The notion of baseload power plants is becoming antiquated in a renewable energy world. Generally, the North American nucelar plants are less flexible than those in France. Nothing to be gained here.